I shot this image amongst others and forgot to note the type. Anybody able to help? looks a little like a sabre toothed tiger to me. if not correct it may help steer you in the right direction? Definitely a reptile, look at the splayed legs and only the saber-like teeth are modified, the rest are uniform. They all like possibles - now I'm confused. Maybe I'll just include all types! 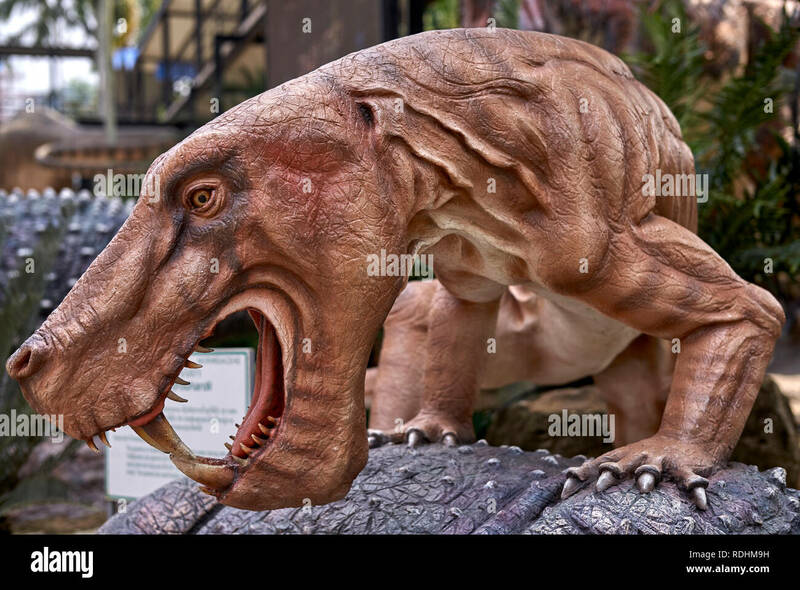 Well, it is worth remembering any photo or model of a dinosaur is just an approximation of what we think they would have looked like. Look at the whole brontosaurus thing - it was a species, no it was a different species put together wrong, now its a species again. Some sort of Cynodont, Cynognathus maybe? Edit: I think Inostrancevia is a better fit.